What Are the Benefits of Playing Free Online Pokies? Playing free online pokies can be a fun experience for anybody that likes pokies. There are thousands of different pokie games out there, each having a different theme, so playing them online for free can allow you to become more familiar with the various games. This can help you see which games you would truly enjoy playing for real money later on. Playing free pokies online can also help you explore the various features offered by the games, such as free spins and bonus features, which vary from one pokie game to another. High Society is a Microgaming free pokies game based on a luxury theme, with symbols like luxury cars, private jets, bags of money, etc. It has five reels and 25 paylines. The game offers two types of free spins, stacked wild symbols, as well as a bonus feature that is activated when you get 3 scatter symbols. This free pokies game has an ice hockey theme, offering symbols like hockey players, pucks, sticks, referees and more. It is offered by Microgaming casinos and is a video slot with 5 reels and 243 paylines. Players can get up to 25 free spins, plus stacked wild symbols. This is a Microgaming pokie with 5 reels and 30 paylines. It uses symbols from the popular Tomb Raider series of video games. The slot allows you to win free spin and has a bonus feature that lets you win more money by going on an adventure around the world. As its name implies, this is a pokie themed after ancient Egypt and made by IGT. It offers 5 reels and 1,024 different ways to win. The scatter symbols appear randomly and can make you win 10, 15 or 20 free spins. This Microgaming pokie is based on the popular sci-fi series created by Glen A. Larson. It has 5 reels and 243 paylines. The pokie has various “game modes,” which can be triggered with the right combination of symbols and let you win up to 1,400,000 credits. This new 5-reel, 25-payline pokie by Microgaming gives you a colourful experience and unique gameplay. It has a candy theme and 5 reels with 25 paylines. The game offers multiple bonus features, including free spins. So Many Monsters is a new Microgaming pokie that has 5 reels and 25 paylines. The game has some funny-looking little monsters that are more cute than scary. If you get 3 or more monster symbols, you can unlock a bonus mode that lets you win more money. 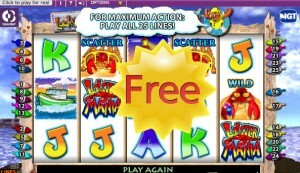 This free pokies game is a new Microgaming game with the standard 5-reel, 25-payline layout of the “So Much More” series. It is based on a Japanese Sushi theme with related symbols. A bonus game and free spins feature are available. This new Microgaming free pokies game is themed after the popular Jurassic Park movie, so you can obviously expect a lot of dinosaur-related symbols. It gives you 5 reels with 243 paylines. There are 6 bonus rounds, as well as a free spins bonus with a multiplier of up to 6x. This pokie existed as a land-based version, but was recently brought online by IGT. It has an ancient Egypt theme, 5 reels and 10 paylines. A free spins bonus feature is activated when you get 3 Pharaoh symbols. During the free spin mode, you get 20 paylines instead of the standard 10.